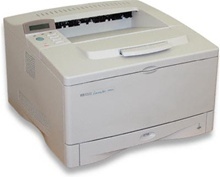 HP LaserJet 5000 Series printers incorporate some of HP's most innovative technologies, establishing new standards for paper-handling, speed, print quality, and network printer management. These printers are ideal for general office, finance, CAD, desktop publishing, marketing and for making screen printing mylars or vellums. And with the ability to print from 3x5 inch to full-bleed 11x17 images, they're an affordable alternative to "multiple-printer" departments or outsourcing. The HP 5000 series is also the perfect choice for paper proofing, to check color separations. Image ready work can also be scanned direct-to-plate with low to high-end scanners. HP LaserJet 5000 Series printers provide a superior network printing solution that includes industry-leading HP Web JetAdmin printer management software and HP JetDirect 600N internal print servers. What's more, every printer comes with one feature you can't get anywhere else: HP's unparalleled reputation for quality, reliability and compatibility. Each unit is refurbished and certified by our HP Authorized Technicians to meet factory specifications. Our Technicians are available to answer any hardware questions you may have. Buy with confidence from The Printer Pros! "Thank you for such a great deal on the LaserJet. It's been a real workhorse of a printer...your technician was extremely helpful"
"I am very pleased with this Laser Printer with such a low page count and will certainly order another one from you guys and will have no hesitancy in recommending your company to the other reporters in my office to use you if they are in need of a printer! Thanks again for all your help"
Paper Media Sizes: Letter, Legal, Tabloid, Custom: 3" x 5" to 12.28" x 18.5"
This refurb 5000n looks and works like new! Works great for our wide format polyester plate printing. We will purchase again from The Printer Pros. Copyright © The Printer Pros. All Rights Reserved.